Situated around 152 km away from the city of Delhi is Deeg. The tiny hamlet was the summer home to the rulers of Bharatpur, which also served as its second capital. The town is bound by massive fortifications along with gorgeous gardens, breathtaking palaces and a multihued marketplace. According to Hindu mythology, the place is located along the parikrama or circumambulation path of Krishna, which begins from Govardhan, which is around 14 km from here. The place also finds its name mentioned in the Skanda Purana as Dirgha or Dirghapur. Deeg was considered as the first capital of the newly established Jat state in the province of Bharatpur in the year 1722. It became the second capital of the region after Suraj Mal shifted the capital to Bharatpur. Best Time To Visit: Deeg is a year-around destination; however, the summer months get extremely hot and humid due to this reason. The best time to visit the place would be from the months of September to March as the weather remains pleasant throughout the year. By Air: The nearest major airport is the Indira Gandhi International Airport at Delhi which is located at a distance of 150 km from here. The airport is well connected to major domestic airports across the country, such as Mumbai, Bengaluru, Kolkata, etc. and to a number of them abroad as well. By Train: Agra Junction is the nearest major railhead, which is located at a distance of 54 km from here. The station has regular trains, which connect to Delhi, Jaipur and other towns and cities across the country. By Road: One of the best ways to reach the place is by road, as the place is well connected by well-maintained roads and has regular bus services to the cities of Jaipur, Delhi, Agra, etc. The total driving distance from Delhi to Deeg is approximately 221 km; and, it would take you about 4 to 5 hours to reach the historic town from Delhi. One can reach the place by taking the following routes from Delhi. Vrindavan is believed to be the place where Lord Krishna grew up under the watchful eyes of Yashoda. Due to this reason, the place is considered extremely holy to the devotees of Lord Krishna. The town is surrounded by a large number of temples in its various shapes and sizes. One would also come across a lot of widows here along with other homeless people, who have dedicated their entire life to serve Lord Krishna. Prem Mandir, ISKCON Temple, Bankebihari Mandir, etc. are some of the well-known temples here. The Prem Mandir is a grand structure built of pure white Italian marble, which grabs the attention of visitors from across the globe. The ISKCON Temple is also an equally grand temple which is dedicated to Krishna and his elder brother Balaram. The temple is built under the guidance of the Srila Prabhupada, who happens to be the founder-acharya of ISKCON. Deeg is place which has a very close connection to the books of history. It said that during the third battle of Panipat, which was fought between the Marathas and an Islamic army lead by Ahmad Shah Durrani to take control over the entire North India, Shamsher Bahadur, who happens to be the son of Baji Rao I and Mastani, died here due to injuries he suffered from the war. In 1804, the British attacked the place to gain control over the place, but had to fight two wars, which are the Battle Deeg and the Siege of Deeg, which were bravely fought by the Maratha warriors alongside the Jat allies. The Deeg Palace here is a major attraction apart from the countless havelis. Built in the year 1772 as a summer resort for the ruler of the Bharatpur state, the palace was very much active until the 1970s. In the year 1730, a fort was constructed around the structure to protect it from attacks from enemies under the patronage of Suraj Mal. 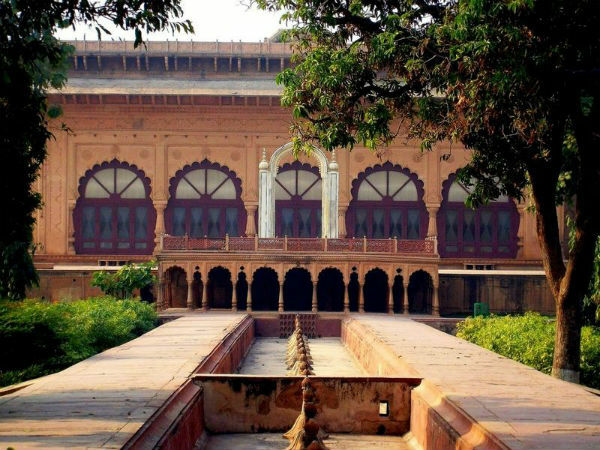 Due to its strategic location and closeness to Agra, the palace had to brave numerous attacks by invaders. The palace takes the shape of a quadrangle and has a garden and a walking path at its centre. To keep the structure cool during summers, there were 900 fountains installed along with flower beds, shrubs and trees. The structure showcases a heavy influence of Mughal architectural style, which is seen its gardens, marble jaalis, stone slabs, etc. One would come across a beautiful marble swing here which is said to have belonged to Nur Jahan and was given as a war present.